How does CanAssist breast make the diagnosis of breast cancer recurrence more accurate and affordable? CanAssist breast from OncoStem Diagnostics is a test that can spare early-stage breast cancer patients from chemotherapy by accurately predicting the risk of recurrence. Each year about 1,50,000 women are detected with breast cancer in India. A majority (~95 per cent) of early stage (Stage 1 &2) breast cancer patients get chemotherapy to avoid cancer recurrence. Currently, there is minimal awareness about tests that predict the risk of cancer recurrence. As a result, patients with low risk of recurrence are often overtreated and consequently bear various toxic effects of chemotherapy treatment that reduces their quality of life. The benefit that early-stage patients receive from chemotherapy is usually low. Since most early-stage patients do well without chemotherapy, this makes accurate risk prediction an all-important prerequisite for effective treatment. It is therefore necessary to detect low-risk instances to avoid overtreatment in the form of chemotherapy, given its side effects and the toll it takes on the patients’ quality of life. With all the advances in science, treating breast cancer isn’t as frightening as it might have been earlier. Today, not all women diagnosed with early stage breast cancer need to undergo chemotherapy. OncoStem’s CanAssist-Breast is designed to classify patients depending on the risk of cancer recurrence. By analysing the patient’s tumour biology, CanAssist-Breast identifies ‘low-risk’ patients who will have minimal benefit of adding chemotherapy to their treatment and ‘high-risk’ patients who will benefit the most by adding it. CanAssist-Breast test provides additional information about the tumour by looking at the expression of proteins present in it. Along with the existing pathology report, CanAssist-Breast can help identify the likelihood of the cancer returning post-surgery and whether the patient is likely to benefit from adding chemotherapy to her treatment. It is important to remember that each patient is different and there is a chance they will not have to undergo chemotherapy at all. CanAssist breast provides information about tumours, which is otherwise unavailable from standard tests. Since the test looks at critical information pertaining to the tumour, it helps doctors design custom-made treatment plans. OncoStem’s CanAssistBreast uses machine learning to solve the problem of over treatment of Breast cancer by accurately predicting the risk of recurrence. CanAssist Breast is performed on the patient’s tumour tissue. This proteomic test result is then fed into the company’s machine learning based statistical algorithm. This, at the end, gives a code that is a number between 1 and 100. If the number is below 15.5, it is a low risk patient and not prone to recurrence. How is it different from other tests in the market for breast cancer recurrence? Tests which predict ‘risk of recurrence’ exist in the West and have helped to identify which early stage patients are in need of chemotherapy, while helping many avoid over treatment. However, these tests are prohibitively expensive and are not well validated on Indian/Asian patients. Therefore, majority of early stage breast cancer patients in India and SE Asia get treated with Chemotherapy and have to bear toxic effects of the treatment which reduces ‘quality of life’ and can be a monetary drain for the patient or society. OncoStem’s CanAssistBreast is a cost-effective test which is well validated on Indian patients. It uses proteomic technology so can help in targeted drug discovery in future which is another added advantage. Our test is priced in such a way to make it cost-effective for our patients to use. The cost of CanAssist-Breast is a fraction of the cost of competing tests from the West which range anywhere between #&8377; 2-3 lakh per test. CanAssist-Breast can spare potentially over 60,000 breast cancer patients in India and about one million patients worldwide every year from the perhaps unnecessary severe side effects and associated costs of chemotherapy. How are you marketing this product? Are you in tie-ups with any healthcare providers? We operate through a partner-based approach to the market. The partners are generally large diagnostic chains that have an established sales team and a strong support network to collect samples. These partners give us seamless reach including access to clinicians globally and help connect with patients in the remote geographies for sample collection. Through partners, we currently have access to 100+ sales personnel who reach out to 1500+ clinicians on a regular basis. SRL and Dr Lal Path are two of the big chains currently partnering with us. With the partners, we have set up a robust network to enable easy test ordering, sample collection and report delivery. The same model can be implemented globally. The clinicians order a test through the sales team. The team interacts with the patient and collects the required samples/reports. Upon completion of the test, the report is delivered to the patient. We collect the payments from the partners on a monthly basis. We are also making efforts to reach out to insurance companies to get their buy-in on the product since it will potentially help insurance companies save unnecessary chemotherapy reimbursement costs. How is healthcare moving towards more tailor-made and personalised therapeutic strategies? The basic premise of tailormade strategies is to ensure maximum efficacy and minimal side-effects of therapy based on each individual patient’s disease characteristics. Over the last few decades scientists have learned that not all breast cancers look the same, with certain subtypes of breast cancer requiring specific types of treatment. For example, breast tumours that are positive for expression of hormone receptors and those overexpressing the HER2 receptor are treated differently than triple negative breast cancers. Trastuzumab (Herceptin) has changed the treatment paradigm for HER2+ breast cancers leading to decreased mortality and improved quality of life for this sub-set of breast cancer patients. With the growing realisation that each patient is unique with inherent genetic differences combined with differences in lifestyles and environment, a clear move away from the one-size-fits-all approach is evident especially in the treatment of cancer patients. Advances in science and technology have led to the development of immune- and gene-based therapies that have changed the way cancer patients are treated. Is OncoStem looking at developing any other tests? If yes, please elaborate? OncoStem is currently working on second test for breast cancer and similar tests for oral and colorectal cancer. Research is underway towards identifying and characterising novel drug targets for breast and oral cancer. What are your growth strategies for the next five years? We intend to touch every patient who can potentially be spared of perhaps unwanted chemotherapy treatment in cancer. 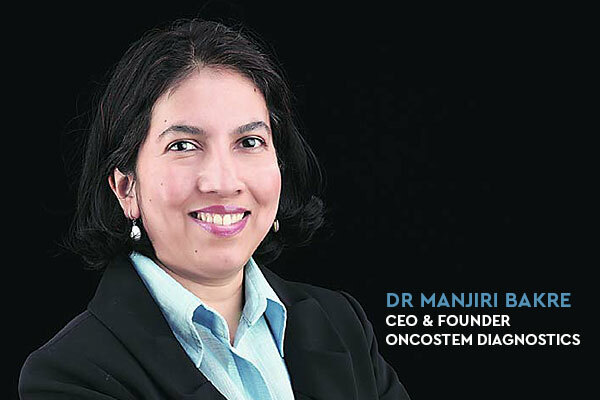 Our go-to-market strategy involves partnering with large diagnostic chains that have access to patients pan-India, cancer focussed hospital chains and other regional centres for cancer care. In addition, we will also be talking to private and government insurance companies about reimbursing the cost of the test to patient. CanAssist-Breast is prescribed by clinicians to the patients. The patient can avail the test by directly contacting OncoStem Diagnostics, Bangalore or our channel partners. The patient will not have to go through any additional surgery to get CanAssistBreast test done. Once the doctor prescribes CanAssistBreast test, the hospital/ laboratory/patient will send tumour blocks (comprising of the tumor tissue, removed during patient’s original surgery) to OncoStem Diagnostics’ laboratory. OncoStem’s NABL accredited central laboratory performs the test and computes risk of recurrence using their proprietary machine learning algorithm. The results are made available to the doctor and the patient to discuss the report and personalise the treatment within 10 working days.